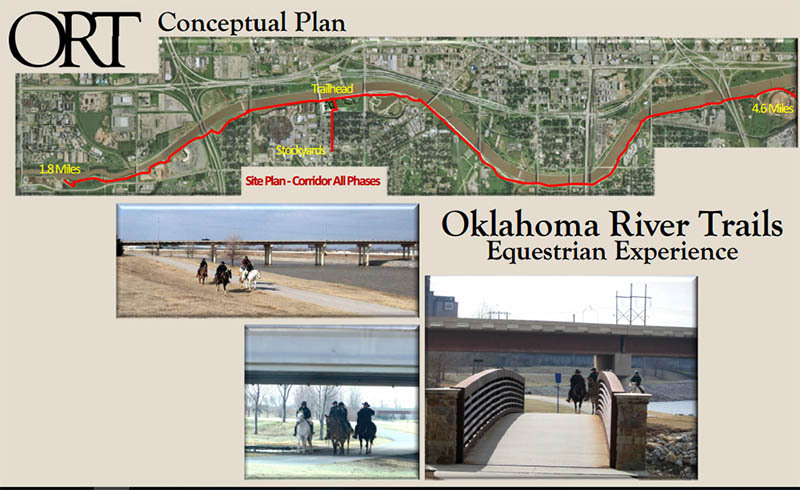 The Oklahoma City Riverfront Redevelopment Authority (OCRRA) is set to approve a conceptual plan for an extensive equestrian facility and riding trails along the south shore of the Oklahoma River. The Greater Oklahoma City Chamber and members of the Oklahoma City Convention and Tourism Commission observed as early as 2010 that in order to fully deliver on Oklahoma City’s longstanding brand promise as a horse-friendly community, it would be highly desirable to develop public facilities where citizens could ride their own horses and arrange horse riding experiences available for hire within the city. 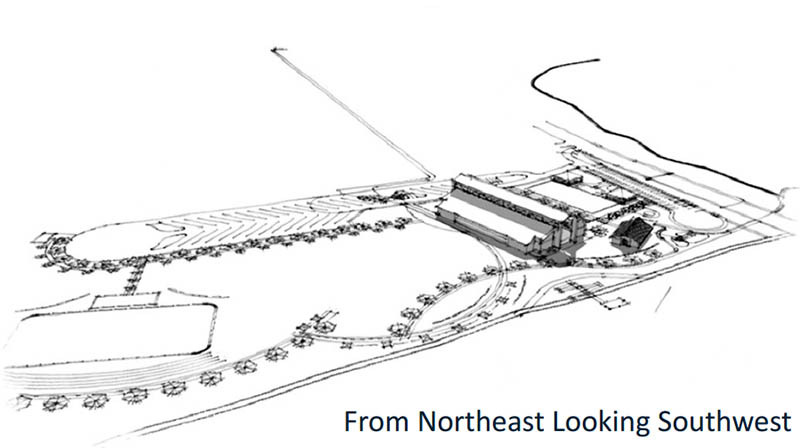 A small group of early stakeholders met over the course of several months, conducting further research and eventually prompting OCRRA to task its on-call engineering consultant to produce a conceptual plan to study the feasibility of a riverfront equine facility. Stakeholders included representatives of Stockyards District businesses and property owners, the county sheriff’s mounted patrol, State Fair of Oklahoma, Oklahoma City Hotel Association and city staff. The study effort was expected to help identify the kinds of amenities a public horse riding facility should include, establish general cost estimates and propose a flexible phased development model for consideration by city staff, river trustees and city council. Triad Design Group has completed its conceptual findings and proposes a series of development phases, beginning with the establishment of a basic horse riding trail, separated from but parallel to the river trail system accommodating bicyclists, runners and pedestrians. Following development of the roughly $400,000 in start-up facilities identified in Phase I, projects outlined in subsequent phases could be implemented at any time, and in any sequence, subject to the availability of funds from public and private sources. Future phases could include additional stables, arena space, competitive polo fields and a boat landing for the Oklahoma River Cruises. Beyond the initial trail elements, future components of the project appear well-suited to the solicitation of private donations and sponsorships. 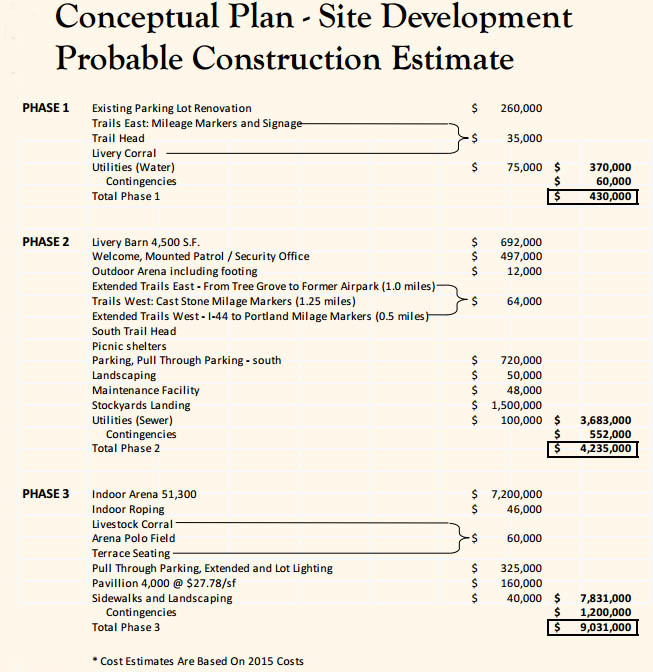 At this time no public or private funds have been solicited for or committed to this project, to date, pending additional study and formal approval by OCRRA trustees and City Council. I love the idea. I wonder if it would be too far-fetched just use the horse facilities at the fairgrounds as the base for the operation and then have some way for riders to cross over or under I-40 via a protected bridge or tunnel (perhaps using May Ave. right of way) to get to the river, which would keep you from having to duplicate facilities that already exist not far away. Just don't sh*t on the bike paths, please. I love this idea, very cool. I agree with Bard, would be really great if you could tie to the fairgrounds, but I'm not sure how you pull that off. Pretty cool and unique (at least from my POV). I had to laugh at "horse-friendly community"... is that really a thing that is widely sought after? A lot of money flows into city coffers every year because OKC makes the effort to be known as a horse-friendly community. It's big, big business, and it's why a major chunk of the fairgrounds are geared to horse folk. Food and drink, sleep nights, sales tax, motel tax. OKC would feel a helluva slap if it decided the horse folk oughta take their critters elsewhere. "At this time no public or private funds have been solicited for or committed to this project"
Yeah, I'm not sure how you pull it off, because it would be no easy thing to figure out how to get horse and rider across the interstate to the river trails. BUT, if you could figure that out, you've already got the arenas, storage, hookups, and parking figured out at the fairgrounds and you wouldn't have to worry about taking up more river frontage with parking or storage for such an enterprise. I looked at Google Maps and it's 1 mile from the Jim Norick arena to the south shore of the river at May Ave and from there you could ride to your heart's content. I had to laugh at "horse-friendly community"... is that really a thing that is widely sought after? Agree with this. Being "horse-friendly" is our brand promise? In regards to the horse turds, the smells from the Stockyards district and the police equestrian facility already make the west end of the trails pretty unappealing on a warm day. Other than infill, I'm not sure this adds to what the boathouse district is looking for. It adds more recreation and things to do on the river, and that's great IMO. Great use of this area near the Stockyards. We had this already with the String of Pearls back in the 80s. That didn't last long. Because of that, I'm worried about the viability of this project too. Not all cities can compete or stand out in every area. If OKC can do things to set itself apart as an equestrian market then that could be really beneficial. Filling the niche gaps can be the most worth the investment. Hope this works out. OT as usual, but you should see parts of Hwy 152 and Mustang road after Western Days. Which is this weekend. Yeah, the ducks already have that covered. Yes but at some point it conflicts with other things "to do" on the river. The two other livestock facilities already take away from what's probably the best system of trails in the urban core. What is taking away from the trails? Or is this just some other "ugh why can't we ditch our western heritage it's embarrassing" stance. I think the smells coming from the stockyards and the police horse facility, which I admit I'm not fond of. Yes the smells definitely have made me think twice about being out there on a windy day. Honestly, I hope we go in another direction. I think there are better uses in the future for riverfront. Pun award for the day! I saw some people riding horses along the south side when I was kayaking on the river over the weekend, so I assumed something like this was already going on. I think it's a good idea, and it will take some time for the side south of the river to develop to the point where the odor and presence is that noxious. If anything, a horse trail will at least provide an activity type that is organic from the stockyards culture, and encourage people to visit the south side of the river more, which incentivizes Capital Hill and Stockyards development further. What would be neat would be if everyday citizens sans their own horse could go down and go on a trail ride themselves. How do you want to see OKC along the river? By cruise? By kayak? By foot? By bike? By horseback? That actually would be really neat. I know ODOT is doing some bridge reconstruction in the next 5 years or so at the Amarillo Junction. Would be nice to see some coordination of effort to work an equestrian trail into the mix. Also, how is the new trail from Lake Hefner to the River getting across I-40? A new bowling facility downtown?